The water chestnut, known scientifically as Eleocharis dulcis, is a type of sedge that grows in marshes. They produce corms, also known as bulbotubers, which have a firm, white flesh and a mild flavor. 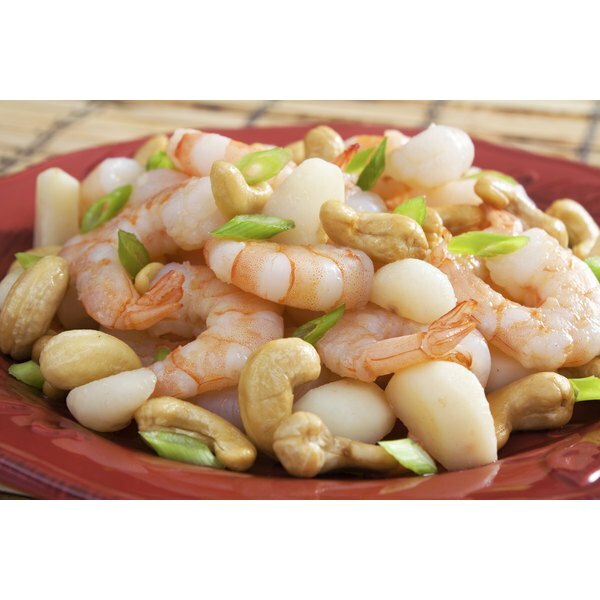 Water chestnuts are common ingredients in Chinese cooking and you can serve them as a side dish. Water chestnuts are high in complex carbohydrates and low in fat like most vegetables. The listed nutritional information comes from Fitbit, a fitness-focused website, and applies to canned water chestnuts. The serving size is 1/2 cup and includes solids and liquids. A serving of water chestnuts contains a total of 35 calories. Carbohydrates contribute 33 calories and protein accounts for the remaining 2 calories. A serving of water chestnuts provides about 1.8 percent of the daily value for calories, assuming a daily diet of 2,000 calories. A serving of water chestnuts contains 8.6 grams of total carbohydrates or about 3 percent of the daily value for total carbohydrates. This includes 1.8 grams of dietary fiber, which is about 7 percent of the daily value for fiber. A serving of water chestnuts also contains 1.6 grams of sugar. Water chestnuts provide 0.6 grams of protein per serving or about 1 percent of the daily value for protein. Alone, this food does not make a significant protein source. They do not contain cholesterol or fat of any type. A serving of water chestnuts contains 6 percent of the daily value of vitamin B6 and 2 percent of the daily value for pantothenic acid and vitamin C. It also contains 1 percent of the daily value for niacin, riboflavin and thiamine. Water chestnuts contain no vitamin A. Water chestnuts provide 4 percent of the daily value for copper, 3 percent of the daily value for iron and 2 percent of the daily value for potassium and zinc. A serving of water chestnuts also contains 1 percent of the daily value for magnesium and phosphorus. Water chestnuts contain no calcium or sodium. Is Vitamin Water Safe During Pregnancy?